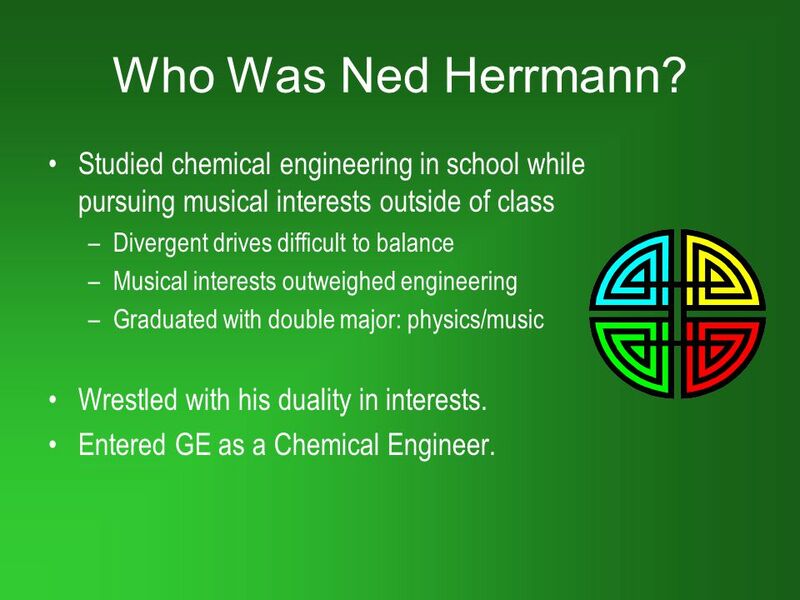 3 Who Was Ned Herrmann? Studied chemical engineering in school while pursuing musical interests outside of class Divergent drives difficult to balance Musical interests outweighed engineering Graduated with double major: physics/music Wrestled with his duality in interests. 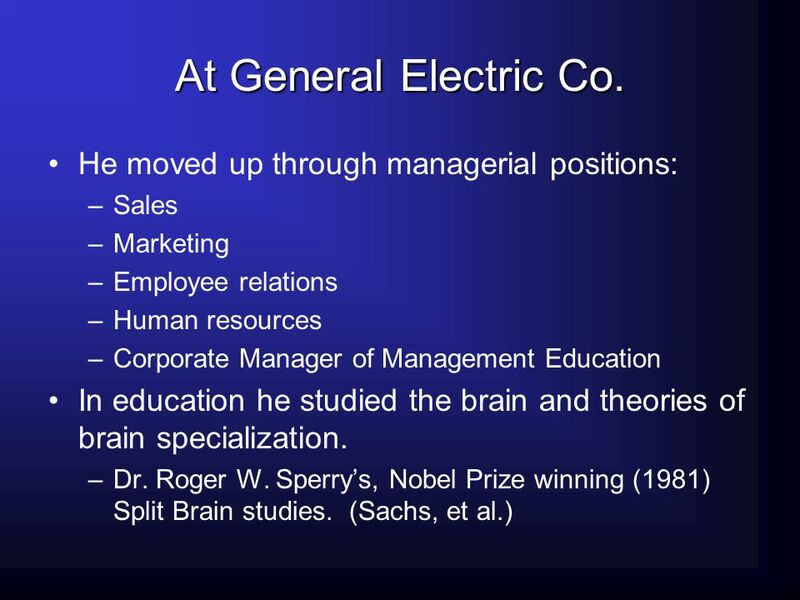 Entered GE as a Chemical Engineer. 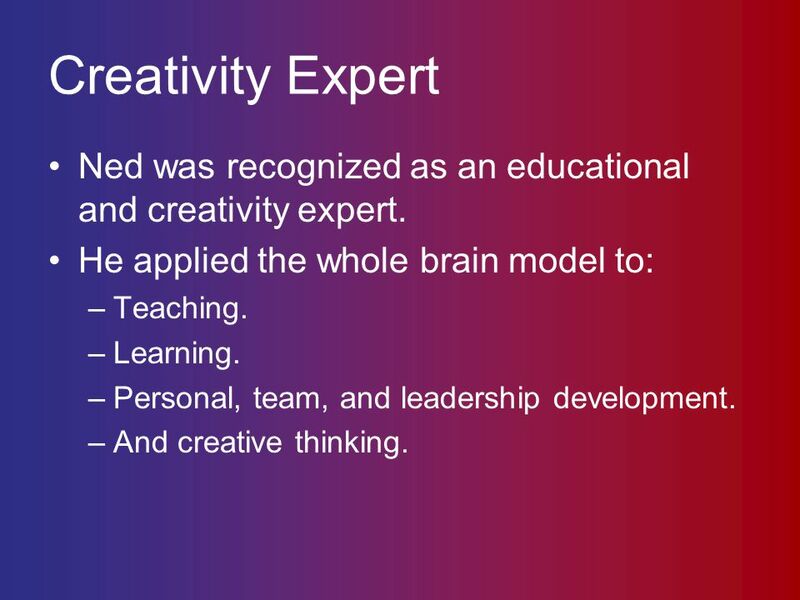 5 Creativity Expert Ned was recognized as an educational and creativity expert. 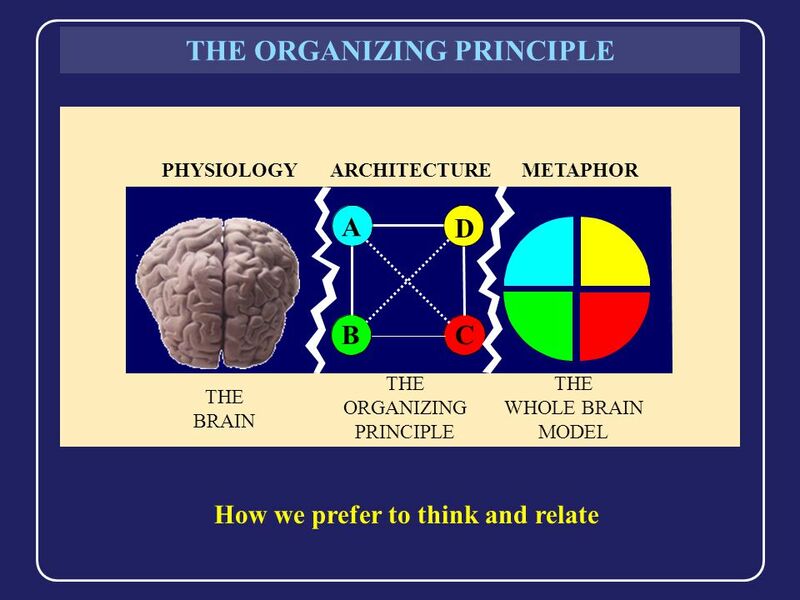 He applied the whole brain model to: Teaching. Learning. Personal, team, and leadership development. And creative thinking. 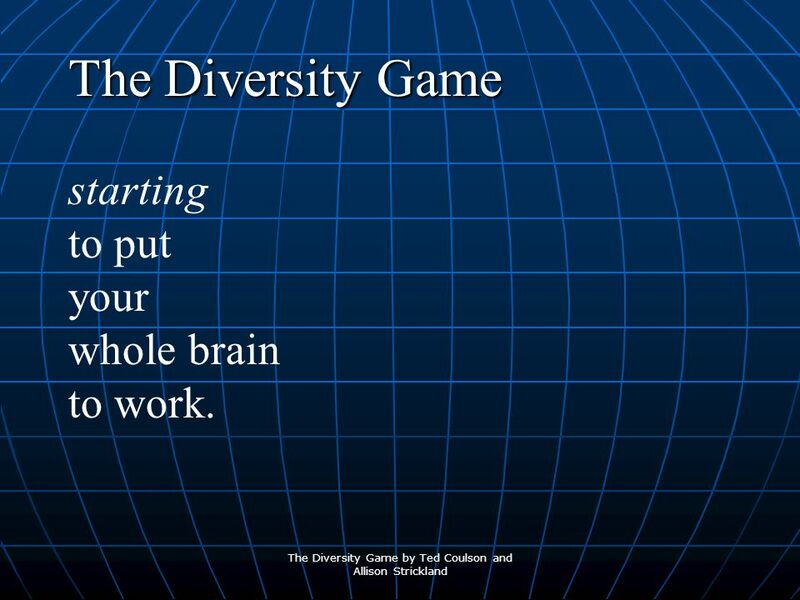 10 The Diversity Game starting to put your whole brain to work. 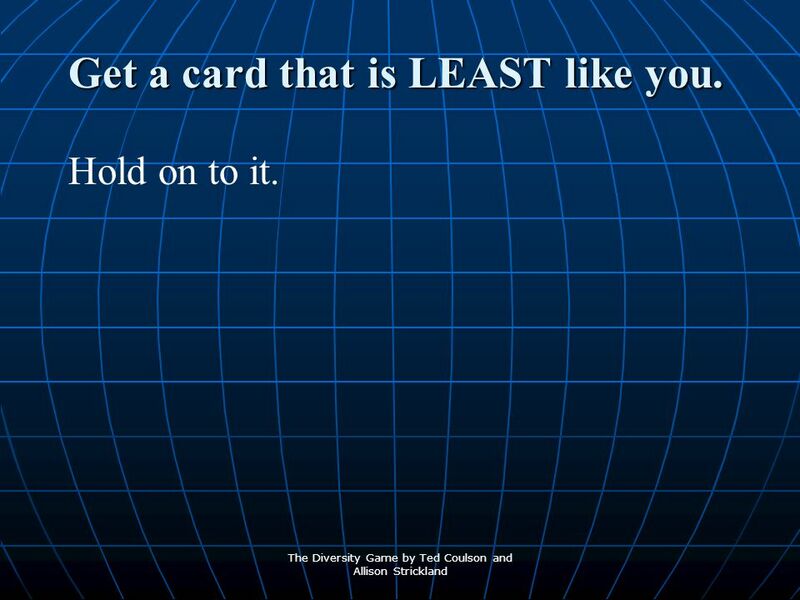 17 Get a card that is LEAST like you. Hold on to it. 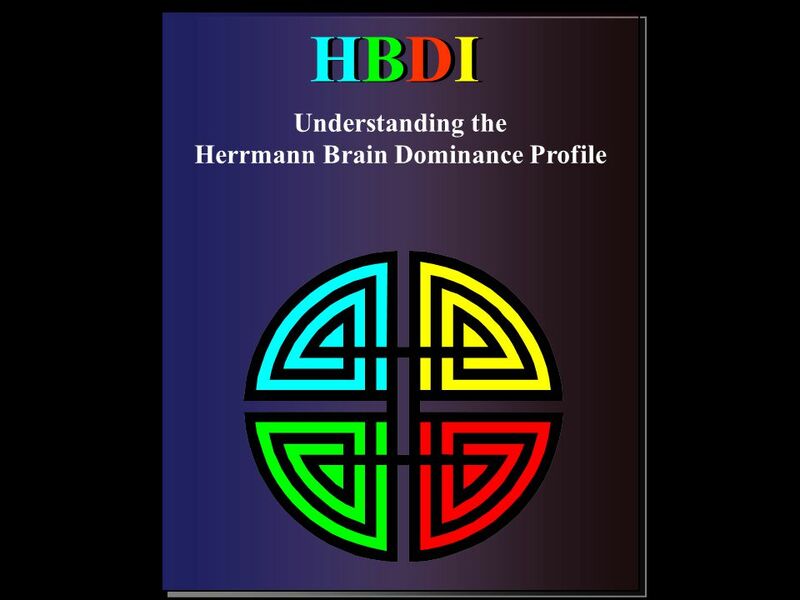 HBDI HBDI Understanding the Herrmann Brain Dominance Profile This presentation is designed to help explain the HBDI profile and accompanying materials. 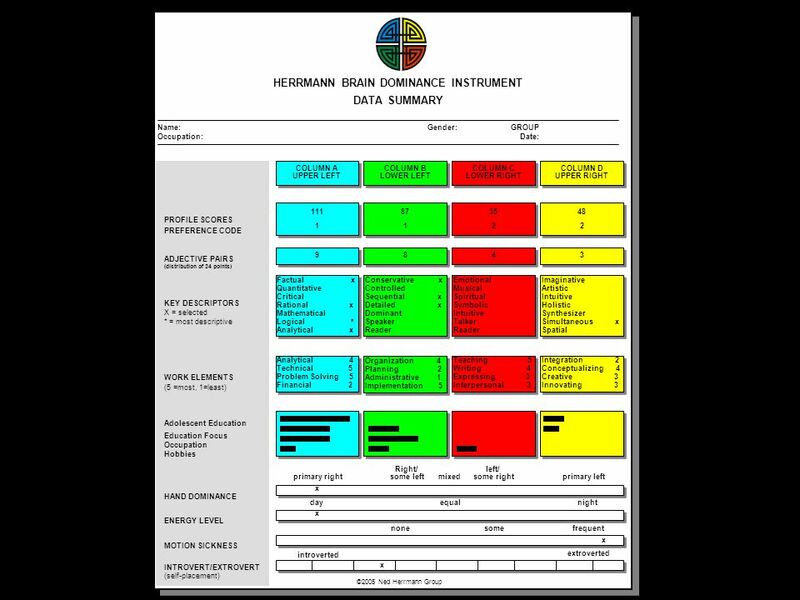 28 This is the profile sheet that displays your data in a visual display. 30 Adjective Pairs 24 Points distributed across the quadrants. PREFERENCE CODE ADJECTIVE PAIRS (distribution of 24 points) KEY DESCRIPTORS X = selected * = most descriptive WORK ELEMENTS (5 =most, 1=least) Adolescent Education Education Focus Occupation Hobbies HAND DOMINANCE ENERGY LEVEL MOTION SICKNESS INTROVERT/EXTROVERT (self-placement) COLUMN A UPPER LEFT COLUMN B LOWER LEFT COLUMN C LOWER RIGHT COLUMN D UPPER RIGHT 111 1 87 35 2 48 9 8 4 3 Factual	x Quantitative Critical Rational	x Mathematical Logical	* Analytical	x Conservative	x Controlled Sequential	x Detailed	x Dominant Speaker Reader Emotional Musical Spiritual Symbolic Intuitive Talker Imaginative Artistic Holistic Synthesizer Simultaneous	x Spatial Analytical	4 Technical	5 Problem Solving 3 Financial	2 Organization	4 Planning	2 Administrative	1 Implementation5 Teaching	5 Writing	4 Expressing	3 Interpersonal	3 Integration	2 Conceptualizing4Creative	3 Innovating	3 introverted primary left left/ some right mixed Right/ some left primary right day equal night some frequent none extroverted x UNDERSTANDING PROFILE SCORES AND THE PREFERENCE CODE What do Profile Scores mean? 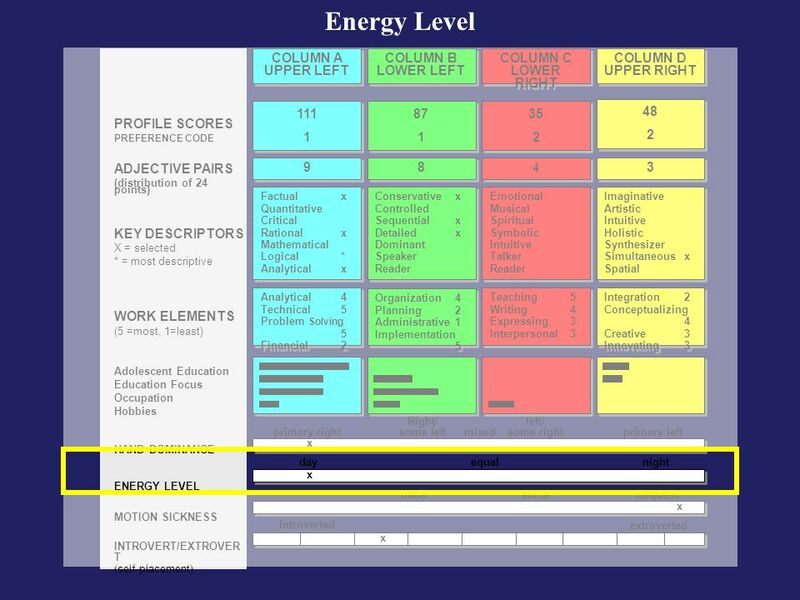 Each Quadrant Score can range from under 10 to over 150. 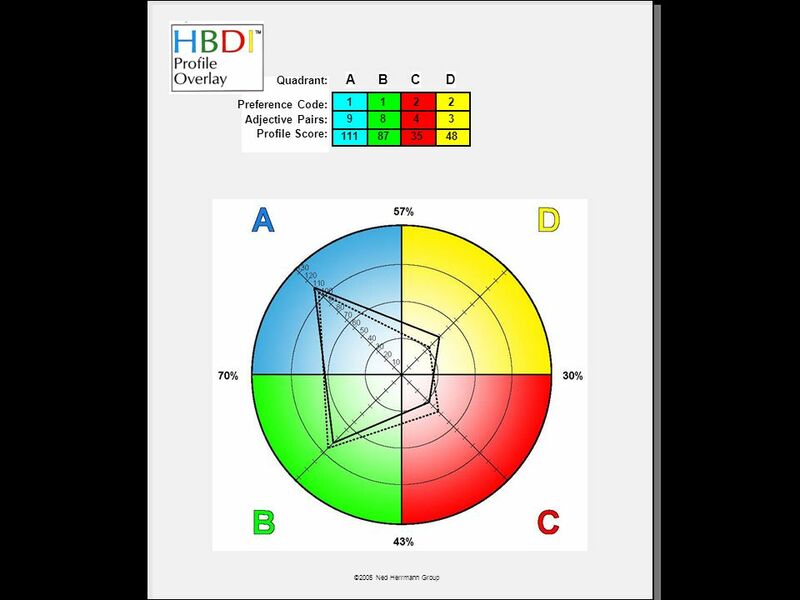 The higher your score in a quadrant, the stronger your preference for thinking in that quadrant. 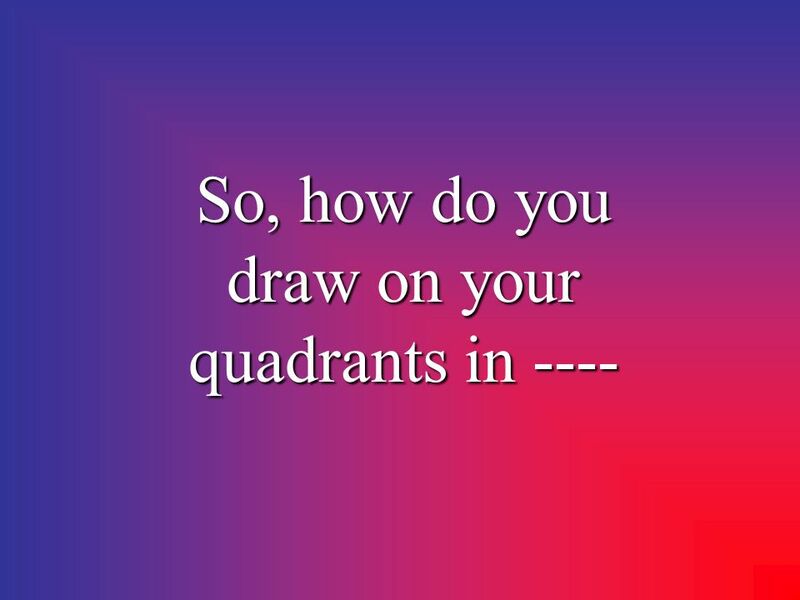 As you can see on this profile, this person has a strong preference for Quadrants A and B thinking styles. 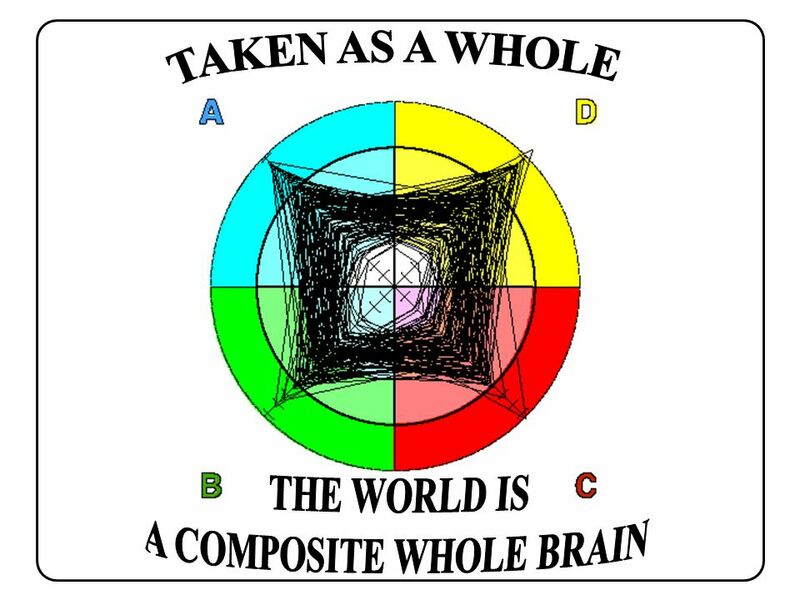 This is indicated by the numbers 98 and 95, as opposed to a less preferred thinking style for Quadrants C and D, which are represented by numbers 59 and 54. What is the Profile Preference Code ? 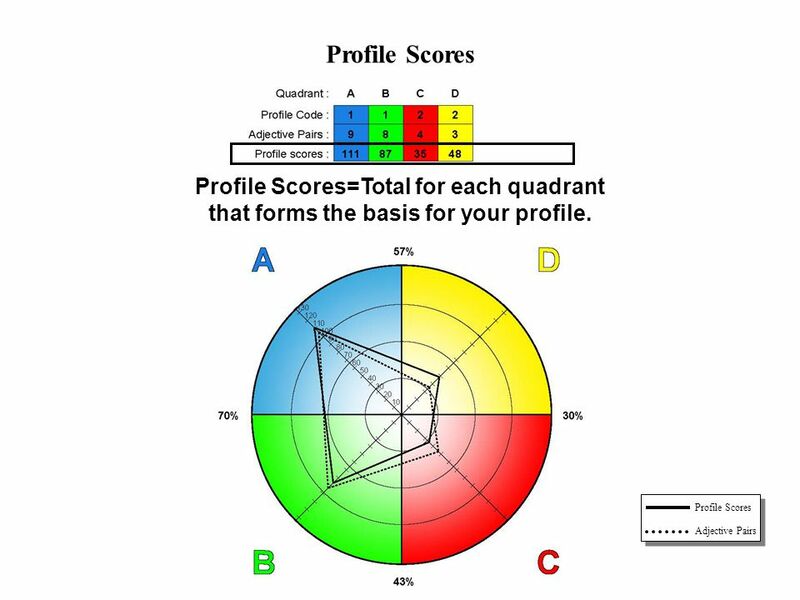 Your Profile Preference Code corresponds to the degree of preference for each quadrant. Your preference code is provided to give you a frame of reference of the group or family of profiles to which your profile belongs. "1" or "Primary" (Score of 67 or above) A primary or strong preference typically indicates a quadrant where you enjoy thinking. A score above 100 indicates a very strong preference, often visible to others. 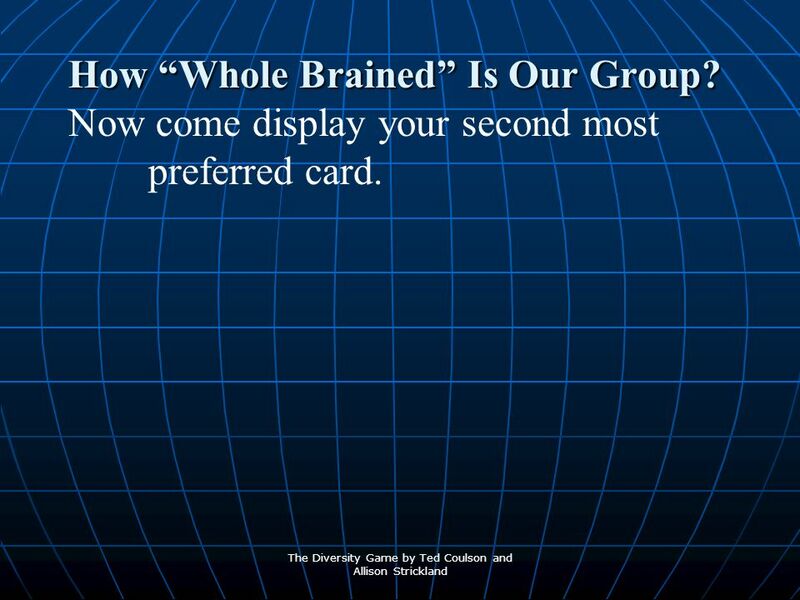 "2" or "Secondary" (Score of 3466) A secondary or intermediate preference represents thinking modes that are comfortable and available as necessary with relative ease. 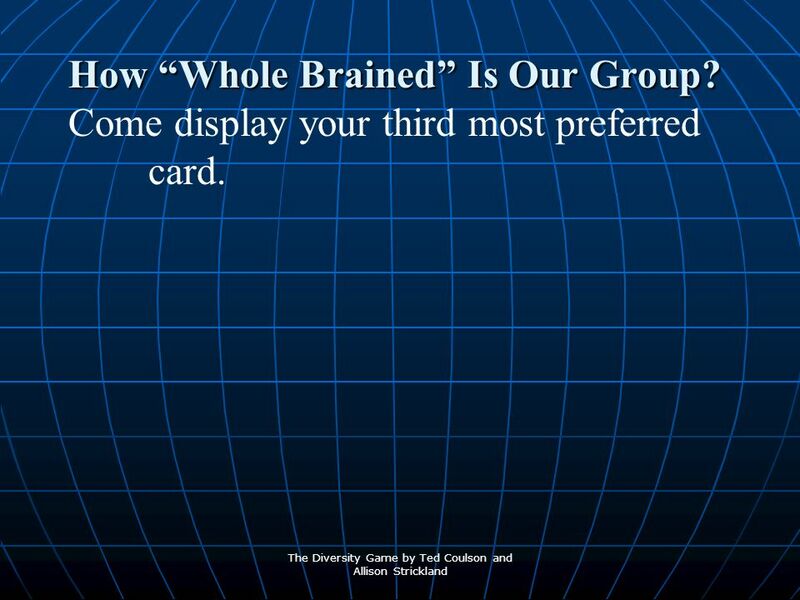 “3" or "Tertiary" (Score less than 34) A tertiary or low preference typically indicates a lack of interest in that mode of thinking, and for some, even an avoidance. 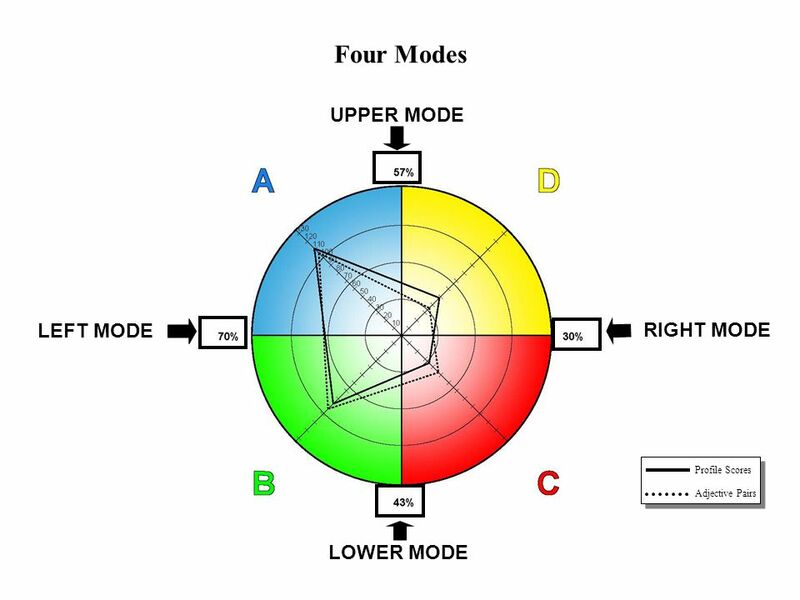 This means that the modes of a tertiary quadrant will, although available to you, be those you will least likely use or with which you feel least comfortable. PREFERENCE CODE ADJECTIVE PAIRS (distribution of 24 points) KEY DESCRIPTORS X = selected * = most descriptive WORK ELEMENTS (5 =most, 1=least) Adolescent Education Education Focus Occupation Hobbies HAND DOMINANCE ENERGY LEVEL MOTION SICKNESS INTROVERT/EXTROVERT (self-placement) COLUMN A UPPER LEFT COLUMN B LOWER LEFT COLUMN C LOWER RIGHT COLUMN D UPPER RIGHT 111 1 87 35 2 48 9 8 4 3 Factual	x Quantitative Critical Rational	x Mathematical Logical	* Analytical	x Conservative	x Controlled Sequential	x Detailed	x Dominant Speaker Reader Emotional Musical Spiritual Symbolic Intuitive Talker Imaginative Artistic Holistic Synthesizer Simultaneous	x Spatial Analytical	4 Technical	5 Problem Solving	5 Financial	2 Organization	4 Planning	2 Administrative	1 Implementation	5 Teaching	5 Writing	4 Expressing	3 Interpersonal	3 Integration	2 Conceptualizing	4 Creative	3 Innovating	3 introverted primary left left/ some right mixed Right/ some left primary right day equal night some frequent none extroverted x UNDERSTANDING ADJECTIVE PAIRS What does the Adjective Pair data indicate? The adjective pair data comes from the forced choice pairings section on the Survey. 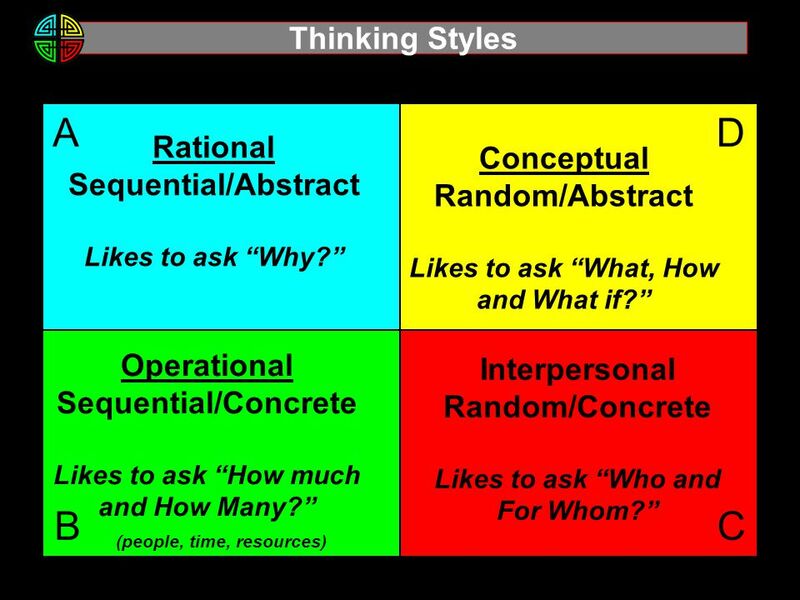 By forcing you to choose between two different terms, this section typically reveals the thinking style distribution that is most instinctive for you. 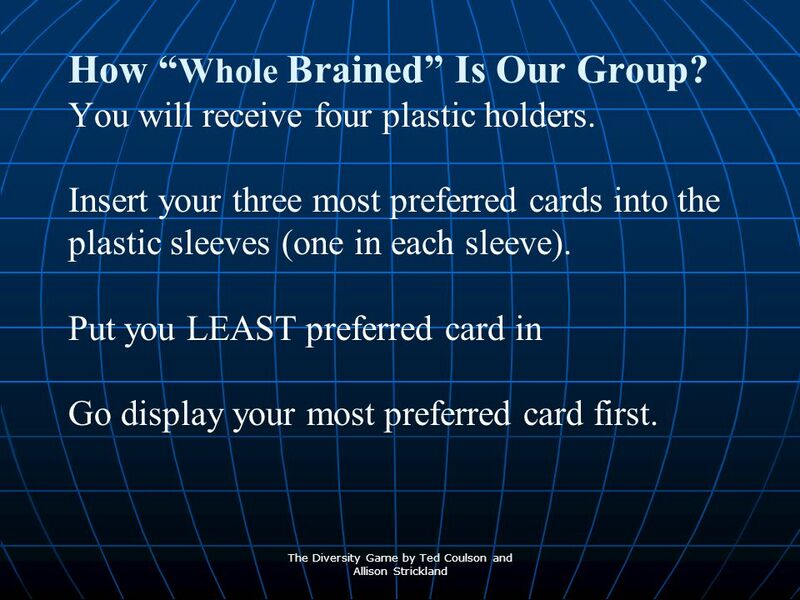 This distribution may or may not be the same as your overall preferences. Your adjective pair data helps indicate your inner or "back up" style of preferred thinking, The highest score typically reveals the thinking style favored in "pressured" situations, which may vary from your "day to day" preferences. Differences between adjective pairs and your overall profile sometimes indicate that your are undergoing a change in preferences in part of your life. Preferences suggested by the adjective pairs may be more visible to others than your overall profile and under pressure situations you may react more in keeping with the adjective pair indications. 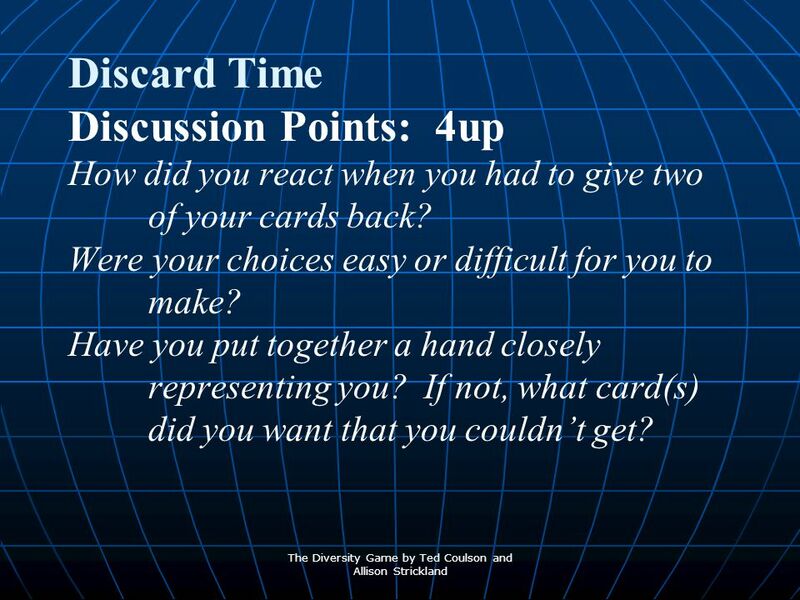 There are 24 pairs, and therefore, 24 points distributed between the four quadrants, providing you made a selection for each pair. PREFERENCE CODE ADJECTIVE PAIRS (distribution of 24 points) KEY DESCRIPTORS X = selected * = most descriptive WORK ELEMENTS (5 =most, 1=least) Adolescent Education Education Focus Occupation Hobbies HAND DOMINANCE ENERGY LEVEL MOTION SICKNESS INTROVERT/EXTROVERT (self-placement) COLUMN A UPPER LEFT COLUMN B LOWER LEFT COLUMN C LOWER RIGHT COLUMN D UPPER RIGHT 111 1 87 35 2 48 9 8 4 3 Factual	x Quantitative Critical Rational	x Mathematical Logical	* Analytical	x Conservative	x Controlled Sequential	x Detailed	x Dominant Speaker Reader Emotional Musical Spiritual Symbolic Intuitive Talker Imaginative Artistic Holistic Synthesizer Simultaneous	x Spatial Analytical	4 Technical	5 Problem Solving	5 Financial	2 Organization	4 Planning	2 Administrative	1 Implementation	5 Teaching	5 Writing	4 Expressing	3 Interpersonal	3 Integration	2 Conceptualizing	4 Creative	3 Innovating	3 introverted primary left left/ some right mixed Right/ some left primary right day equal night some frequent none extroverted x KEY DESCRIPTORS The key descriptors represent general preferences you chose when completing the instrument. 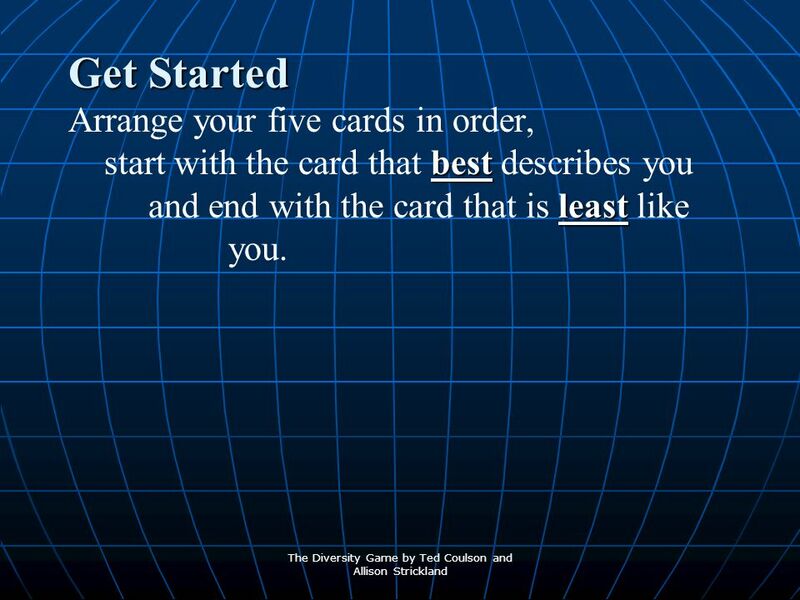 In this section you were asked to select 8 adjectives from the 25 displayed, which describe the way you see yourself. Your selections are indicated by an X. 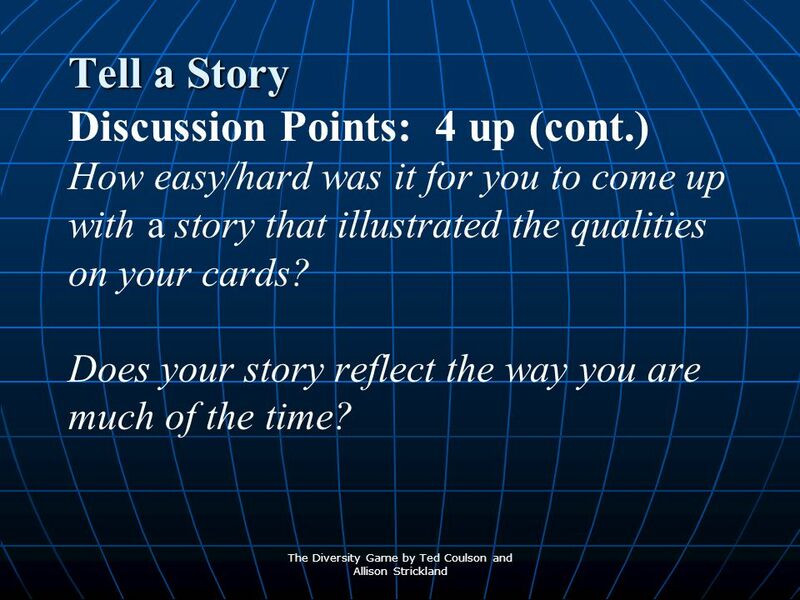 You then selected on of those 8 as "most descriptive" of you. Your most descriptive adjective is indicated by an asterisk (*) Look over the distribution of your selection. 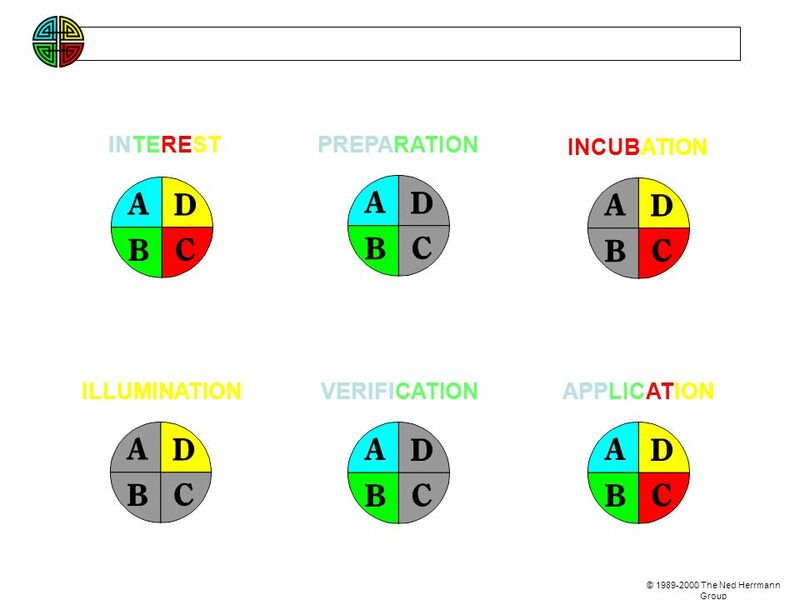 Do they cluster in certain quadrants or are they distributed across all four? Is the distribution of selections consistent with your overall profile scores? PREFERENCE CODE ADJECTIVE PAIRS (distribution of 24 points) KEY DESCRIPTORS X = selected * = most descriptive WORK ELEMENTS (5 =most, 1=least) Adolescent Education Education Focus Occupation Hobbies HAND DOMINANCE ENERGY LEVEL MOTION SICKNESS INTROVERT/EXTROVERT (self-placement) COLUMN A UPPER LEFT COLUMN B LOWER LEFT COLUMN C LOWER RIGHT COLUMN D UPPER RIGHT 111 1 87 35 2 48 9 8 4 3 Factual	x Quantitative Critical Rational	x Mathematical Logical	* Analytical	x Conservative	x Controlled Sequential	x Detailed	x Dominant Speaker Reader Emotional Musical Spiritual Symbolic Intuitive Talker Imaginative Artistic Holistic Synthesizer Simultaneous	x Spatial Analytical	4 Technical	5 Problem Solving	5 Financial	2 Organization	4 Planning	2 Administrative	1 Implementation	5 Teaching	5 Writing	4 Expressing	3 Interpersonal	3 Integration	2 Conceptualizing	4 Creative	3 Innovating	3 introverted primary left left/ some right mixed Right/ some left primary right day equal night some frequent none extroverted x WORK ELEMENTS When completing this section of the HBDI you were asked to rank order the work elements from 1 (work you do least well) to 5 (work you do best). 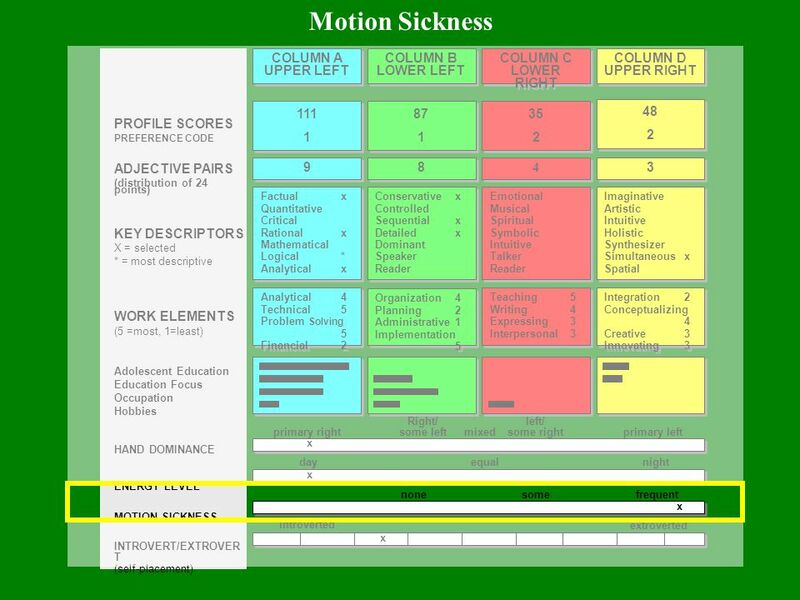 Your rankings are shown, sorted into the four quadrant display. 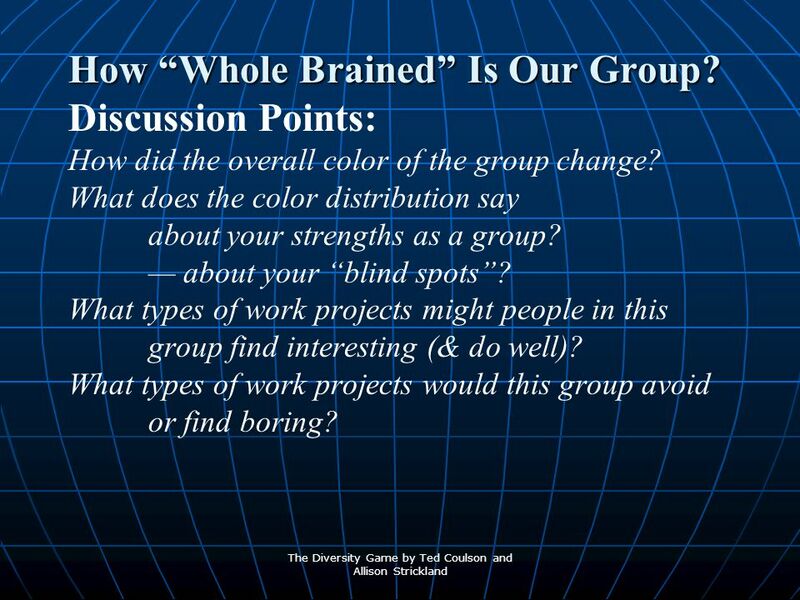 Your "work preferences" show thinking styles that are most accessed inn a work environment. This is often influenced by training, assignments, opportunities and challenges your work experiences have provided. Note your selections. Where do the higher rankings (4's & 5's) appear? 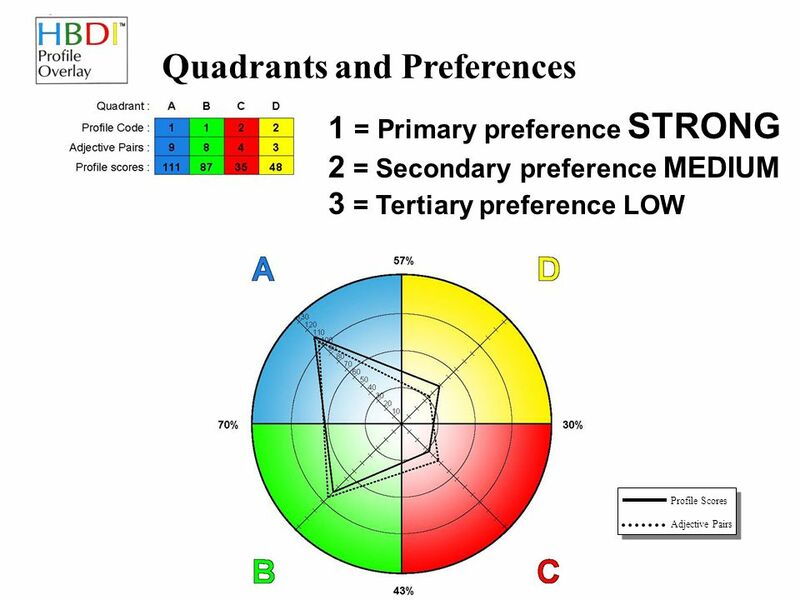 Check for clusters of preferences in certain quadrants and lack of preferences in others. Now compare this section with your Key Descriptors section. Are they similar or different? 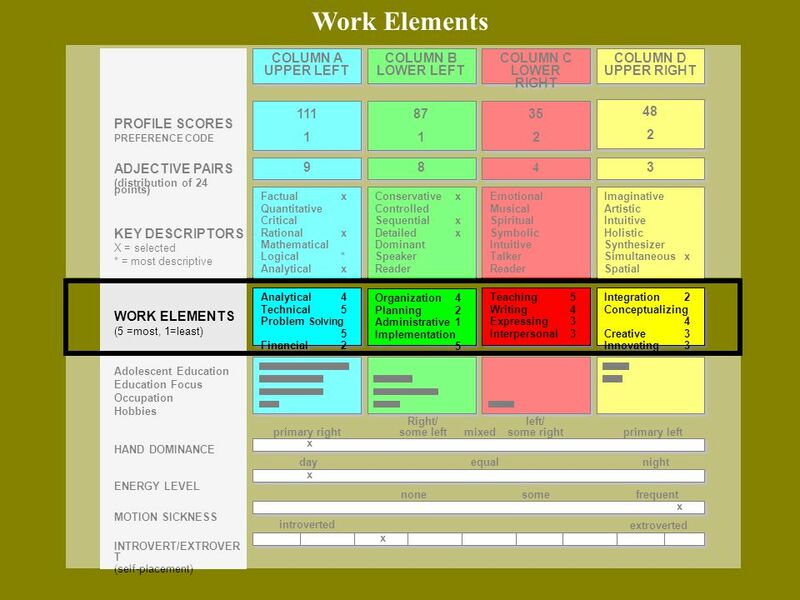 Your data may reveal situational work preferences which have developed that are perhaps somewhat different from your overall "general" key descriptor preferences. 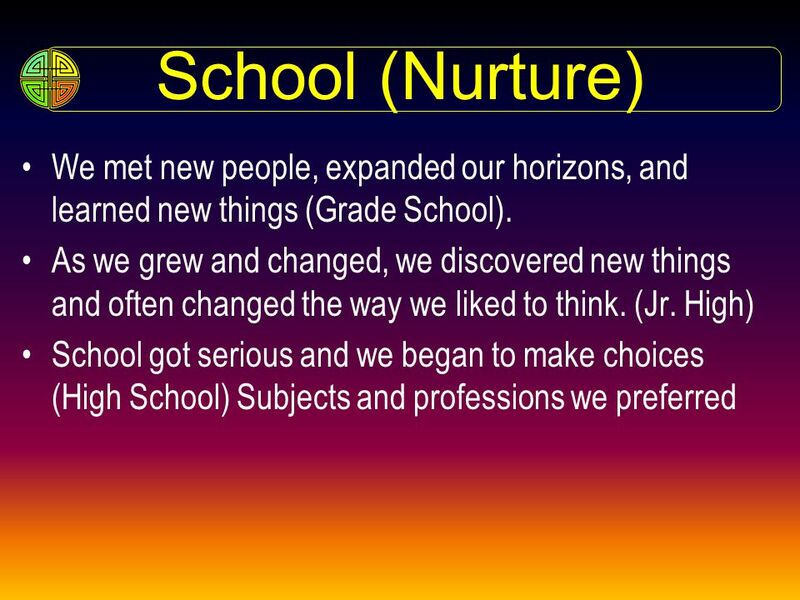 38 WHY ADOLESCENT EDUCATION and EDUCATIONAL FOCUS? 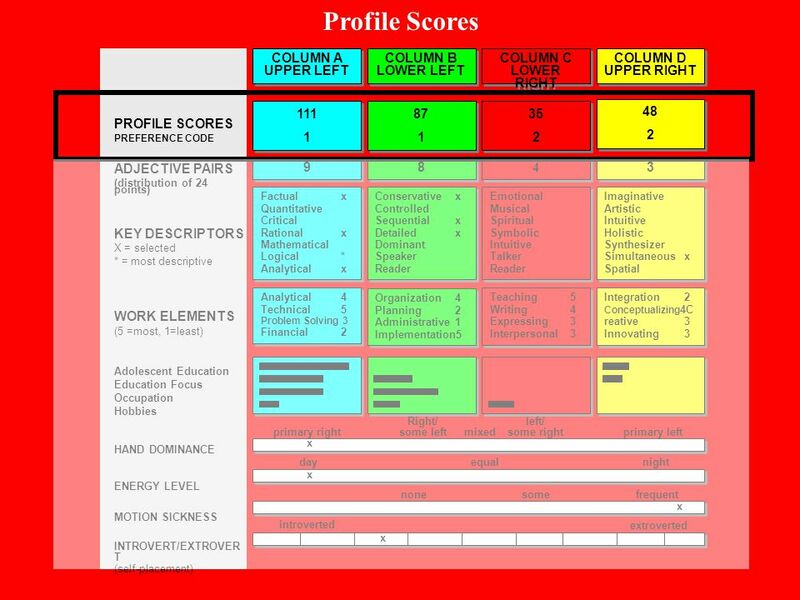 PROFILE SCORES PREFERENCE CODE ADJECTIVE PAIRS (distribution of 24 points) KEY DESCRIPTORS X = selected * = most descriptive WORK ELEMENTS (5 =most, 1=least) Adolescent Education Education Focus Occupation Hobbies HAND DOMINANCE ENERGY LEVEL MOTION SICKNESS INTROVERT/EXTROVERT (self-placement) COLUMN A UPPER LEFT COLUMN B LOWER LEFT COLUMN C LOWER RIGHT COLUMN D UPPER RIGHT 111 1 87 35 2 48 9 8 4 3 Factual	x Quantitative Critical Rational	x Mathematical Logical	* Analytical	x Conservative	x Controlled Sequential	x Detailed	x Dominant Speaker Reader Emotional Musical Spiritual Symbolic Intuitive Talker Imaginative Artistic Holistic Synthesizer Simultaneous	x Spatial Analytical	4 Technical	5 Problem Solving	5 Financial	2 Organization	4 Planning	2 Administrative	1 Implementation	5 Teaching	5 Writing	4 Expressing	3 Interpersonal	3 Integration	2 Conceptualizing	4 Creative	3 Innovating	3 introverted primary left left/ some right mixed Right/ some left primary right day equal night some frequent none extroverted x WHY ADOLESCENT EDUCATION and EDUCATIONAL FOCUS? 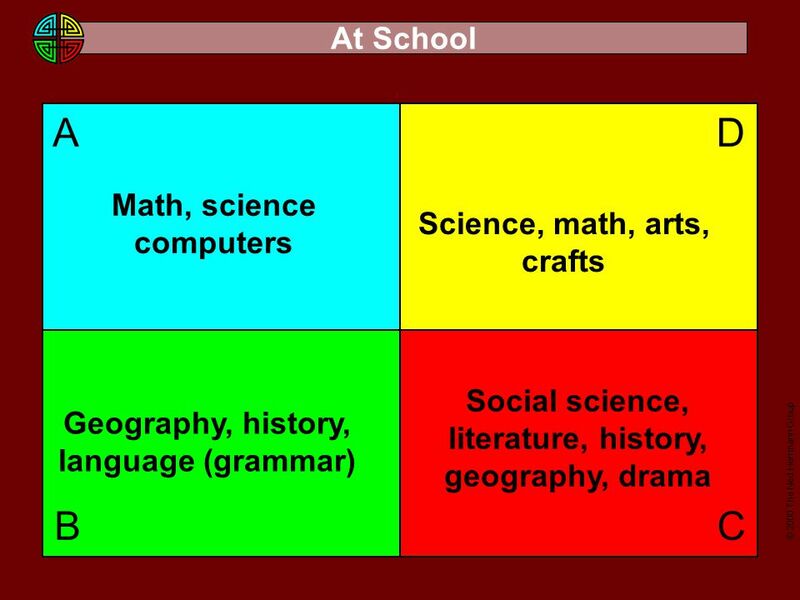 An indicator of an earlier, often influential, time of your life, ranking school subjects can indicate an early orientation toward math, foreign language or native language, and through that orientation a possible inclination toward associated thinking styles. 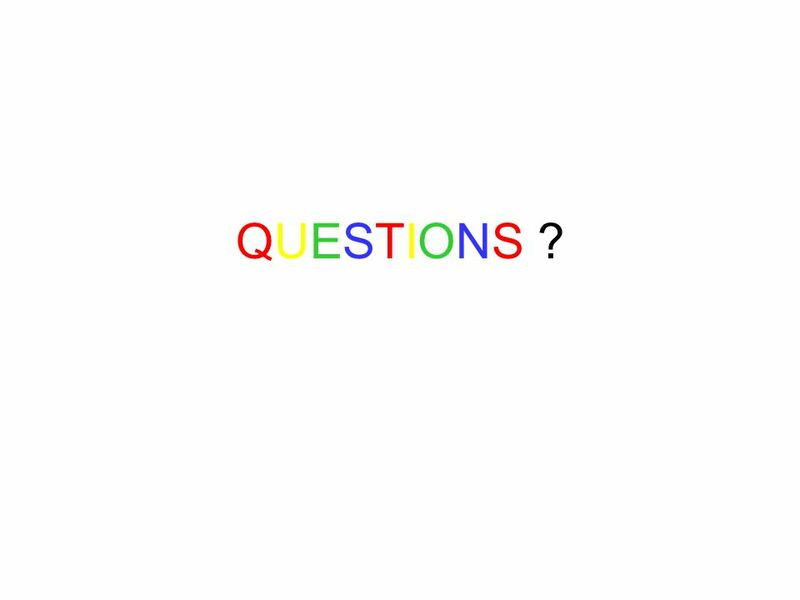 Additional clues are provided about the tilt of your mental preferences through understanding preferred subjects in school, education and occupational choices and how you spend your leisure time. The data has been consolidated, sorted into quadrants, and grouped together for comparative purposes. 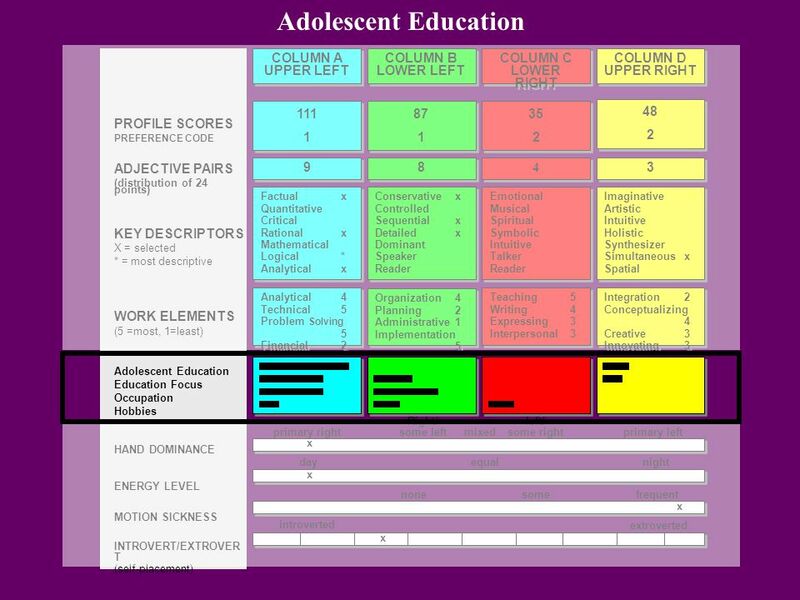 A bar chart indicates the distribution of preferences for the categories of Adolescent Education, Educational Focus, Occupation and Hobbies. ADOLESCENT EDUCATION, EDUCATIONAL FOCUS, OCCUPATION AND HOBBIES (Continued) Research has shown that many of our thinking style preferences are developed or acquired from the influence of our environment. Both educational and occupational choices may be primary influences. 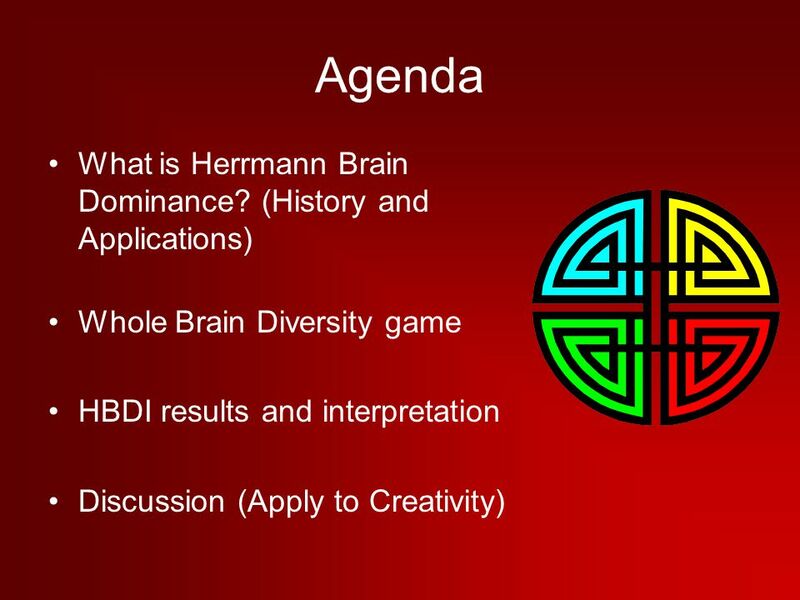 The educational and occupational information you provided is another important clue to your brain dominance profile. Hobbies also provide additional clues about your preferred thinking styles. They are evaluated not on the characteristics of the hobbies themselves, but rather on the preferences of those people who engage in those particular hobbies. PREFERENCE CODE ADJECTIVE PAIRS (distribution of 24 points) KEY DESCRIPTORS X = selected * = most descriptive WORK ELEMENTS (5 =most, 1=least) Adolescent Education Education Focus Occupation Hobbies HAND DOMINANCE ENERGY LEVEL MOTION SICKNESS INTROVERT/EXTROVERT (self-placement) COLUMN A UPPER LEFT COLUMN B LOWER LEFT COLUMN C LOWER RIGHT COLUMN D UPPER RIGHT 111 1 87 35 2 48 9 8 4 3 Factual	x Quantitative Critical Rational	x Mathematical Logical	* Analytical	x Conservative	x Controlled Sequential	x Detailed	x Dominant Speaker Reader Emotional Musical Spiritual Symbolic Intuitive Talker Imaginative Artistic Holistic Synthesizer Simultaneous	x Spatial Analytical	4 Technical	5 Problem Solving	5 Financial	2 Organization	4 Planning	2 Administrative	1 Implementation	5 Teaching	5 Writing	4 Expressing	3 Interpersonal	3 Integration	2 Conceptualizing	4 Creative	3 Innovating	3 introverted primary left left/ some right mixed Right/ some left primary right day equal night some frequent none extroverted x HAND DOMINANCE Hand dominance is readily recognized. Most of us consider ourselves either left or right handed. 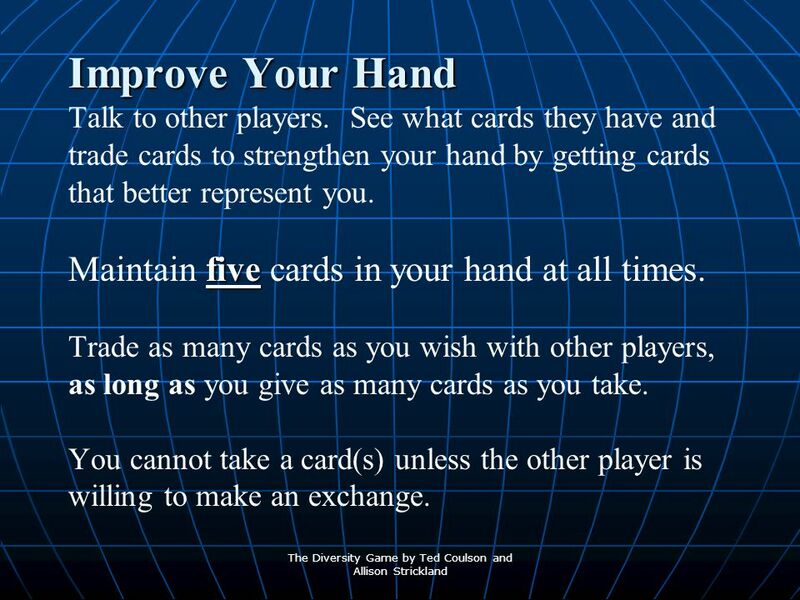 Handedness provides a simple example of the body's tendency toward dominance in paired structures. Analysis of our data indicates a slight connection between left handedness and right brain dominance and right handedness and left-brain dominance. Data continues to be gathered for research in this area. 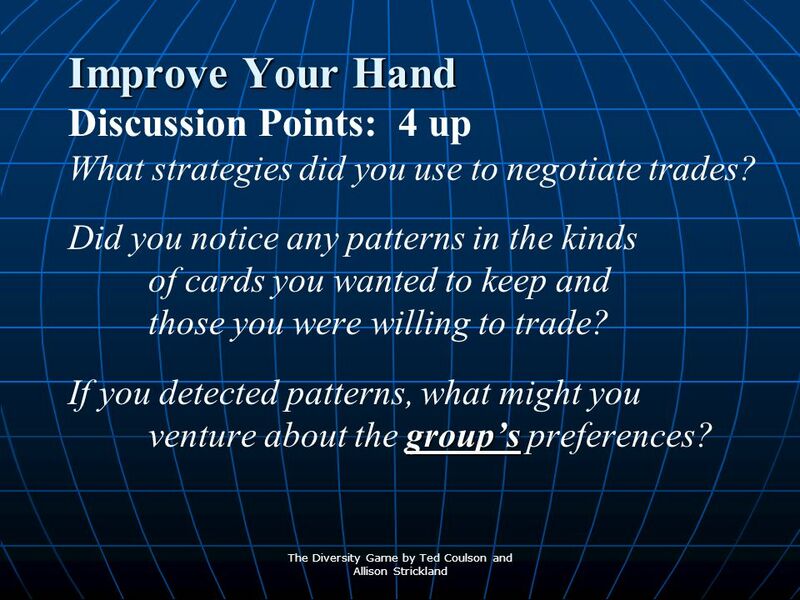 The hand position question on the survey provides another interesting research opportunity. Handwriting is a connection to language processing a powerful mental process. 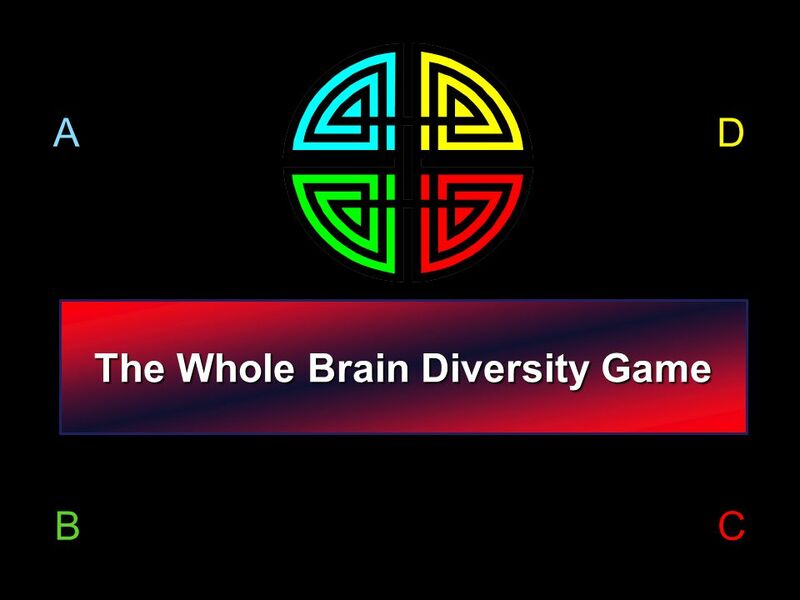 Current research indicates that language is processed primarily in the left cerebral hemisphere for most people, but in a more distributed fashion for some left handers and ambidextrous individuals. PREFERENCE CODE ADJECTIVE PAIRS (distribution of 24 points) KEY DESCRIPTORS X = selected * = most descriptive WORK ELEMENTS (5 =most, 1=least) Adolescent Education Education Focus Occupation Hobbies HAND DOMINANCE ENERGY LEVEL MOTION SICKNESS INTROVERT/EXTROVERT (self-placement) COLUMN A UPPER LEFT COLUMN B LOWER LEFT COLUMN C LOWER RIGHT COLUMN D UPPER RIGHT 111 1 87 35 2 48 9 8 4 3 Factual	x Quantitative Critical Rational	x Mathematical Logical	* Analytical	x Conservative	x Controlled Sequential	x Detailed	x Dominant Speaker Reader Emotional Musical Spiritual Symbolic Intuitive Talker Imaginative Artistic Holistic Synthesizer Simultaneous	x Spatial Analytical	4 Technical	5 Problem Solving	5 Financial	2 Organization	4 Planning	2 Administrative	1 Implementation	5 Teaching	5 Writing	4 Expressing	3 Interpersonal	3 Integration	2 Conceptualizing	4 Creative	3 Innovating	3 introverted primary left left/ some right mixed Right/ some left primary right day equal night some frequent none extroverted x MOTION SICKNESS This research is based on studies done by Dr. Charles S. Mirabile Jr. For many, motion sickness is caused by conflicting information from two separate systems: the visual system and the inner ear of the auditory system. Right mode people usually tolerate the inconsistent information and as a result, experience motion sickness. 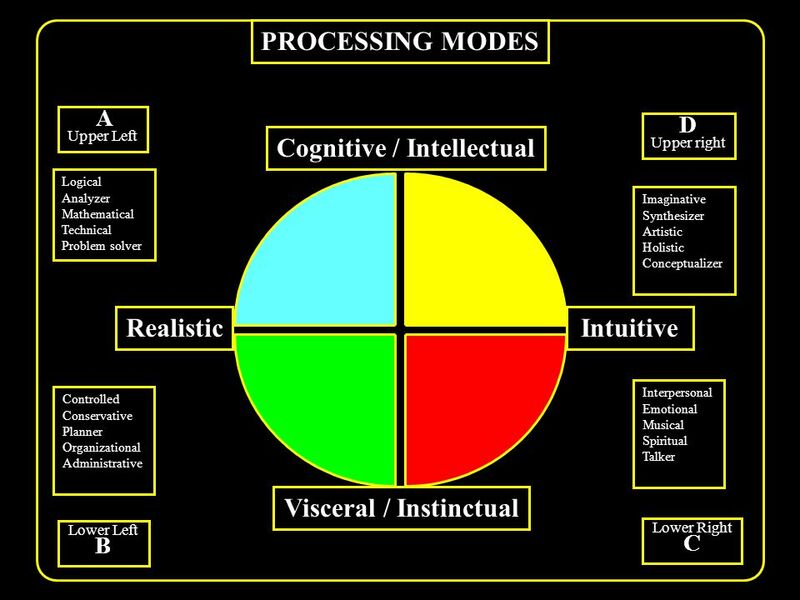 In contrast, many left mode individuals are more likely to override or ignore one of the conflicting inputs. They eliminate the ambiguous condition so they remain in control and therefore, are less likely to experience motion sickness. PREFERENCE CODE ADJECTIVE PAIRS (distribution of 24 points) KEY DESCRIPTORS X = selected * = most descriptive WORK ELEMENTS (5 =most, 1=least) Adolescent Education Education Focus Occupation Hobbies HAND DOMINANCE ENERGY LEVEL MOTION SICKNESS INTROVERT/EXTROVERT (self-placement) COLUMN A UPPER LEFT COLUMN B LOWER LEFT COLUMN C LOWER RIGHT COLUMN D UPPER RIGHT 111 1 87 35 2 48 9 8 4 3 Factual	x Quantitative Critical Rational	x Mathematical Logical	* Analytical	x Conservative	x Controlled Sequential	x Detailed	x Dominant Speaker Reader Emotional Musical Spiritual Symbolic Intuitive Talker Imaginative Artistic Holistic Synthesizer Simultaneous	x Spatial Analytical	4 Technical	5 Problem Solving	5 Financial	2 Organization	4 Planning	2 Administrative	1 Implementation	5 Teaching	5 Writing	4 Expressing	3 Interpersonal	3 Integration	2 Conceptualizing	4 Creative	3 Innovating	3 introverted primary left left/ some right mixed Right/ some left primary right day equal night some frequent none extroverted x INTROVERT/EXTROVERT Your self-placement in the introvert/extrovert scale on the survey is replicated on the report. In very general terms, introverts tend to be more left mode oriented, and extroverts more right mode oriented. 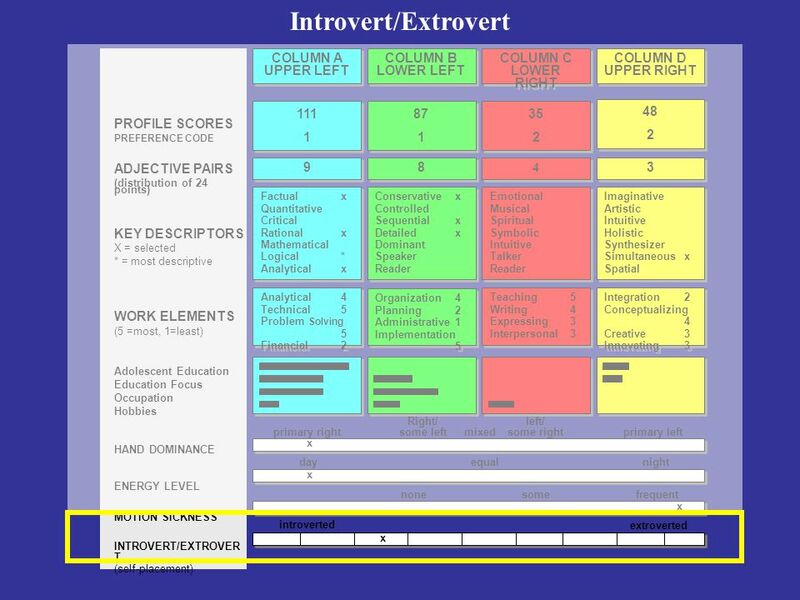 However, each quadrant may have its own continuum of introvert to extrovert and thus, its own interpretation and impact. A Quadrant Introvert: Quiet, serious, and very focused. 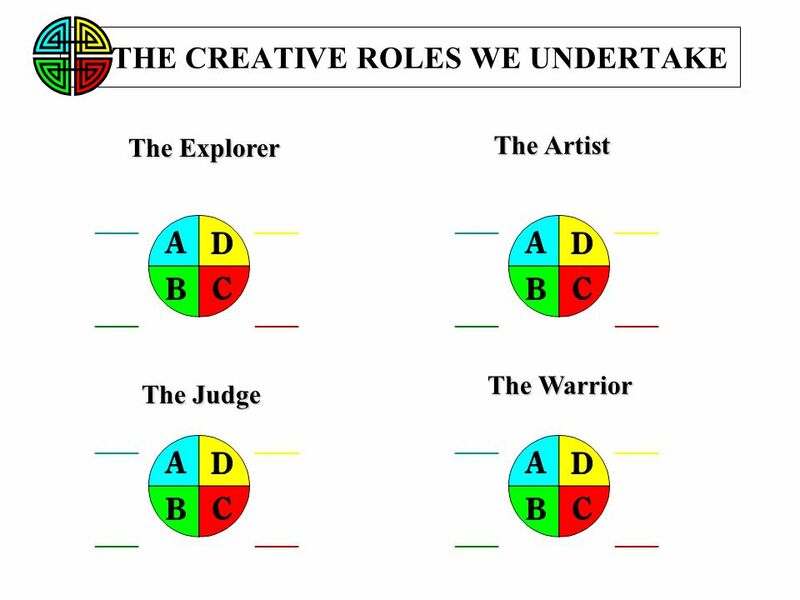 A Quadrant Extrovert: Debater, often funny, driven. 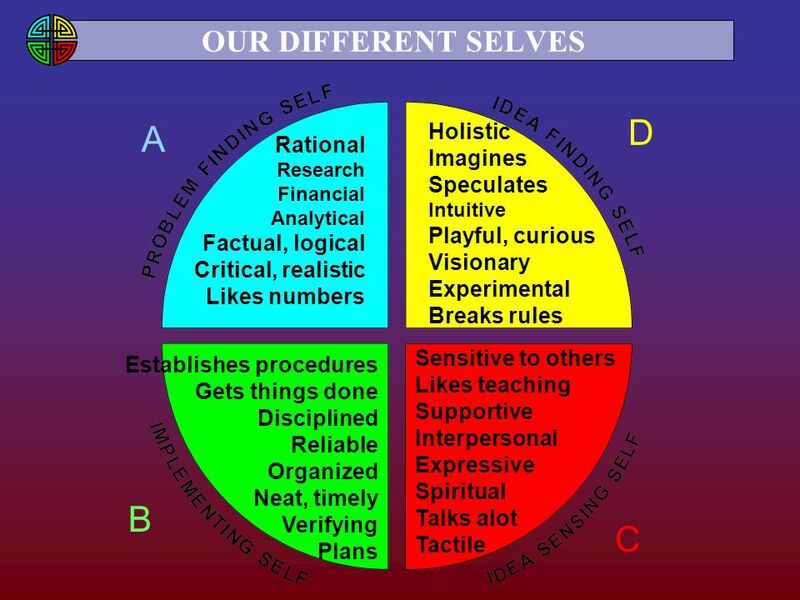 B Quadrant Introvert: Controlled, always "doing", often keeps to self. B Quadrant Extrovert: Dominant, "organizer" of events and people. C Quadrant Introvert: Expressive through writing or nonverbal, caring in a quiet way. 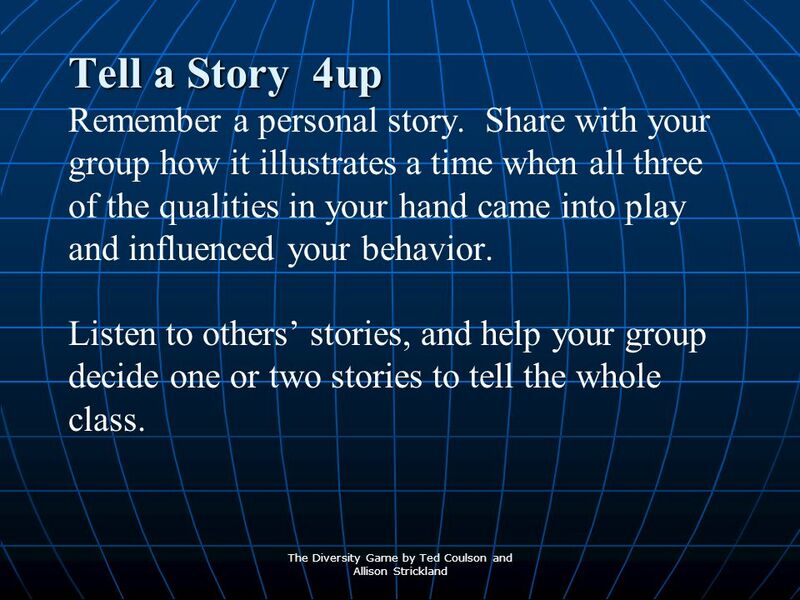 C Quadrant extrovert: Talkative interested in bringing people together, sharing. 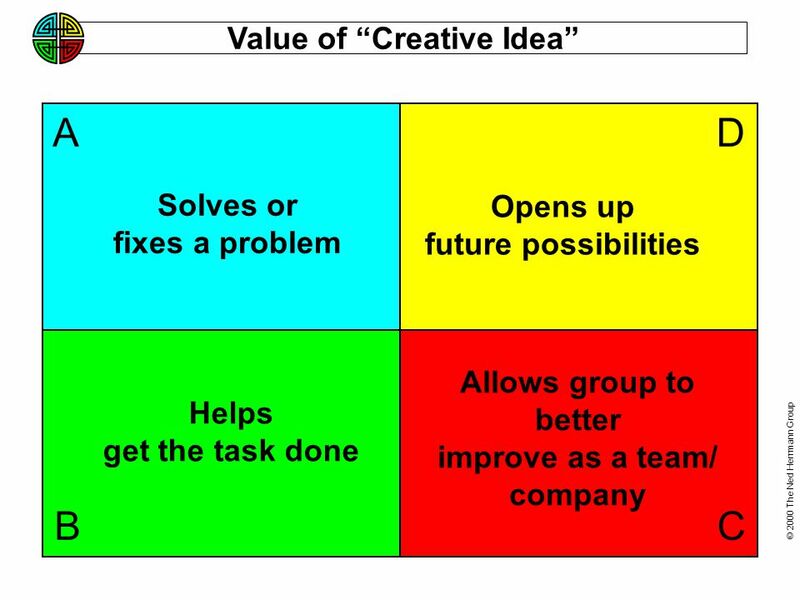 D Quadrant Introvert: Off in own world, does "own thing", loner D Quadrant Extrovert: Constant flow of ideas loves to experiment with others, have fun. 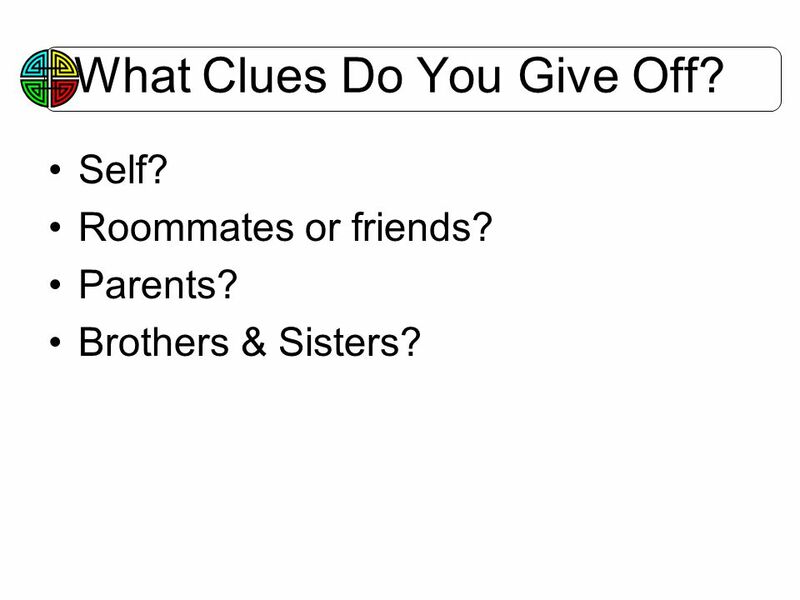 53 What Clues Do You Give Off? Self? Roommates or friends? Parents? Brothers & Sisters? 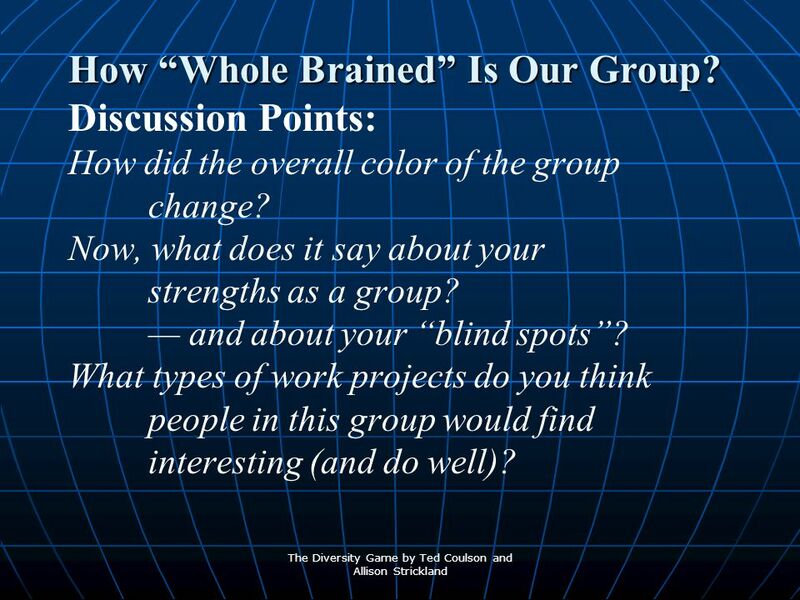 How “Whole Brained” Is Our Group? 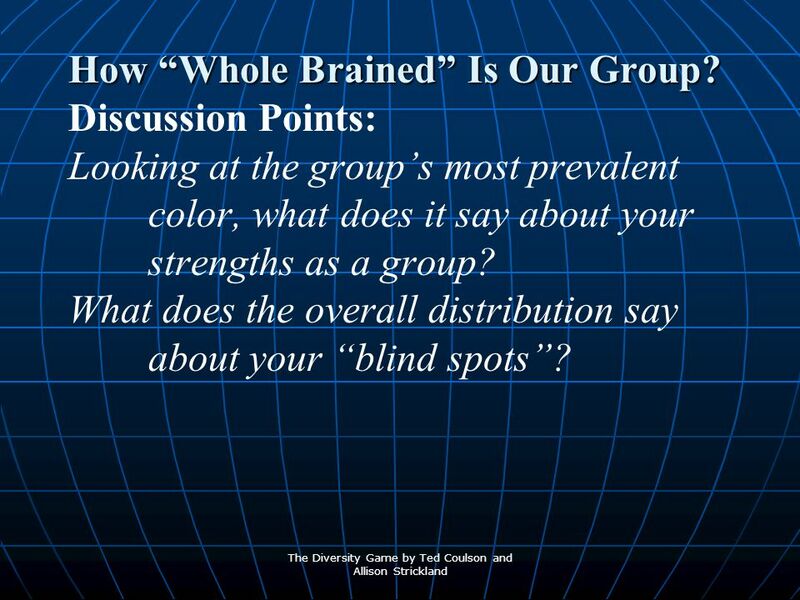 Discussion Points: If you lack diversity, how might you compensate for areas where there is no strong preference? 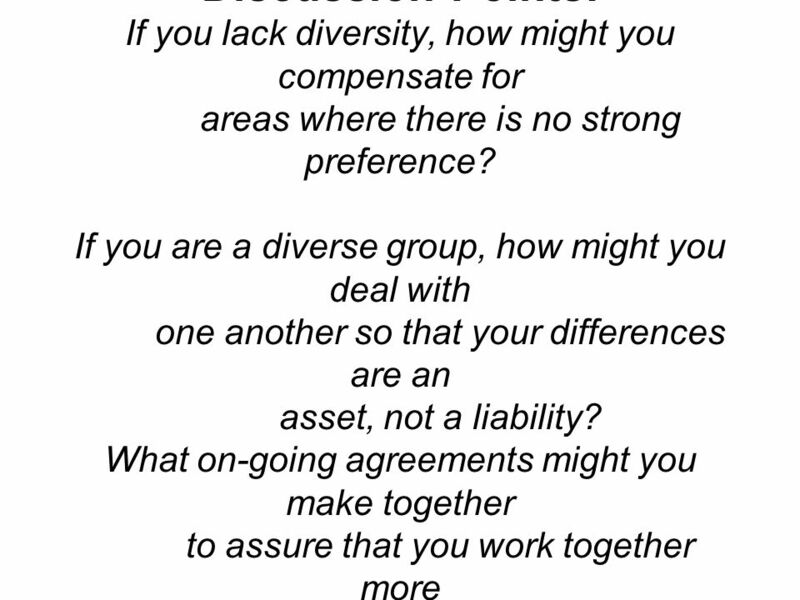 If you are a diverse group, how might you deal with one another so that your differences are an asset, not a liability? 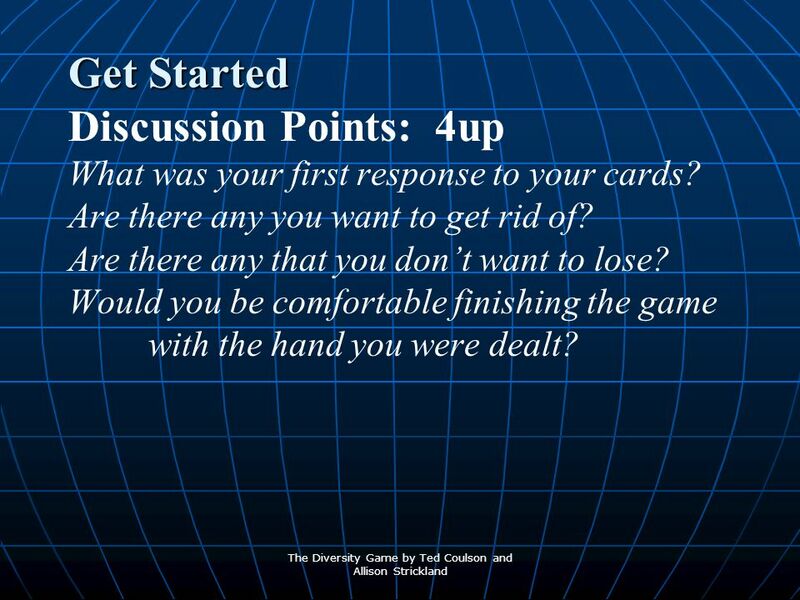 What on-going agreements might you make together to assure that you work together more effectively? 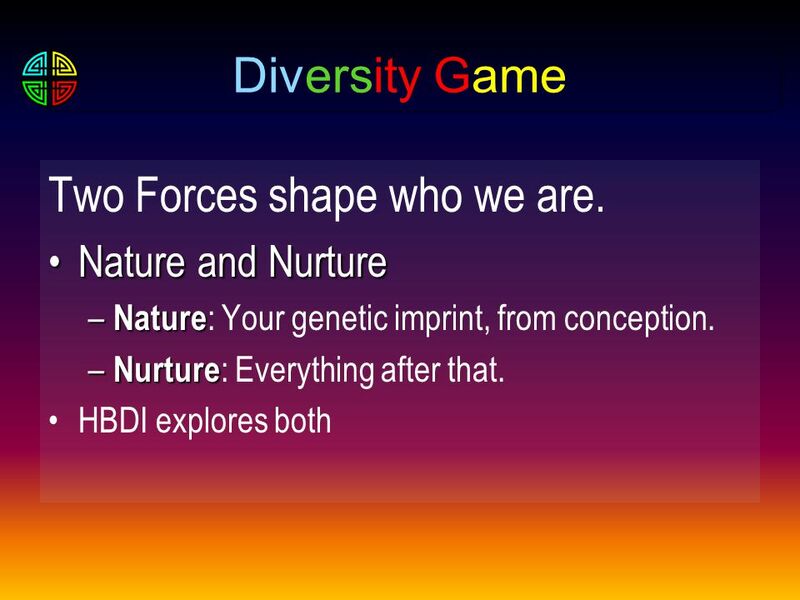 56 Two Forces shape who we are. 57 Nature What were you like the day you were born? Where and to whom were you born? We see many differences. 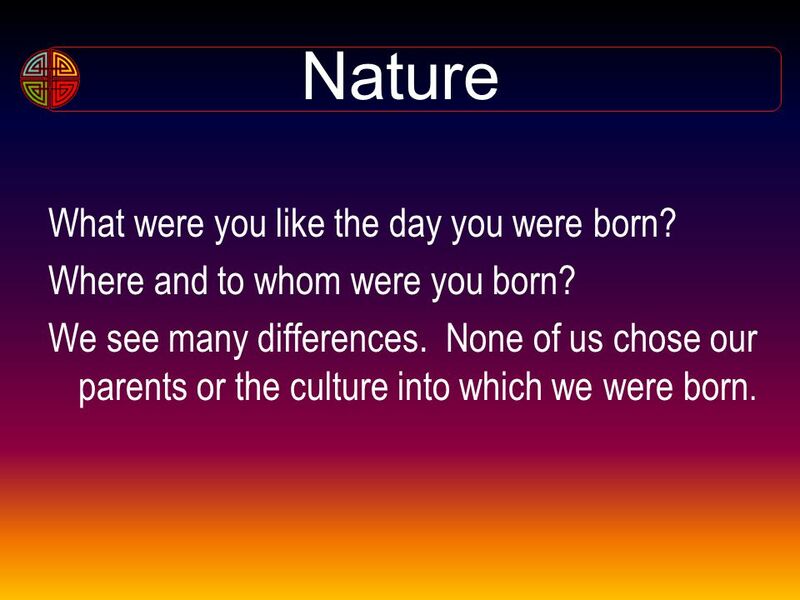 None of us chose our parents or the culture into which we were born. 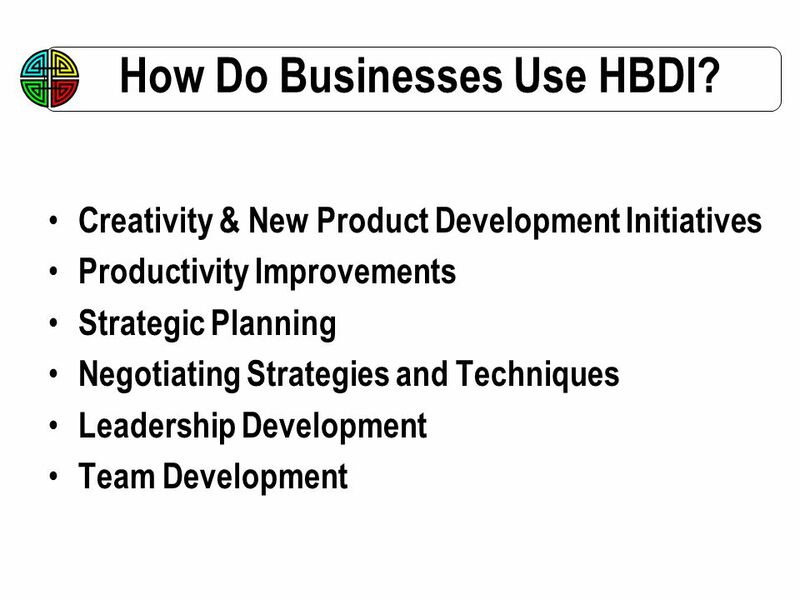 59 How Do Businesses Use HBDI? 61 Class Profile Begin End ___ Blue cards. 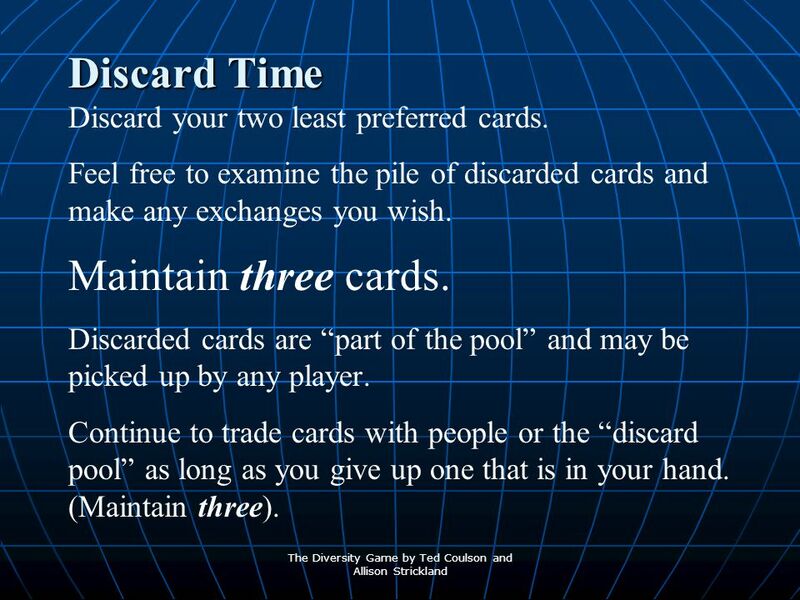 ___ Blue cards. ___ Green cards. ___ Green cards. ___ Red cards. ___ Red cards. ___ Yellow cards. 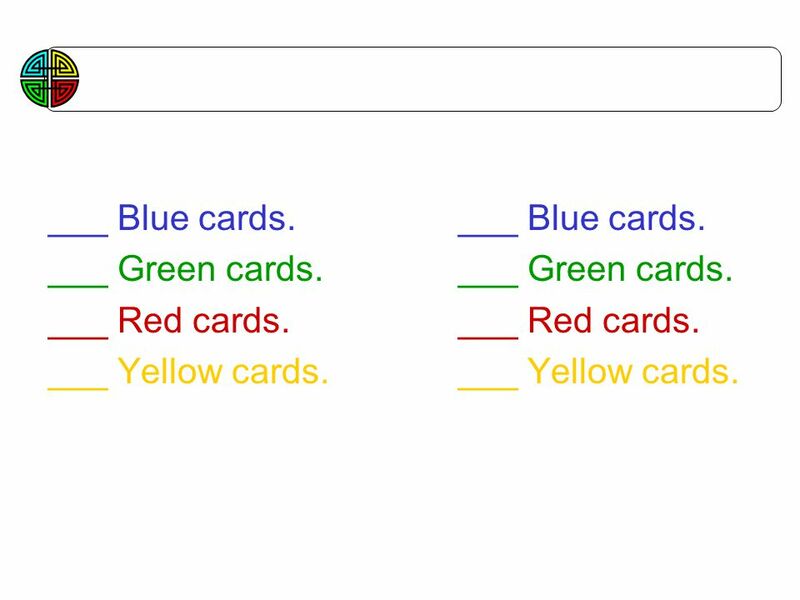 ___ Yellow cards. 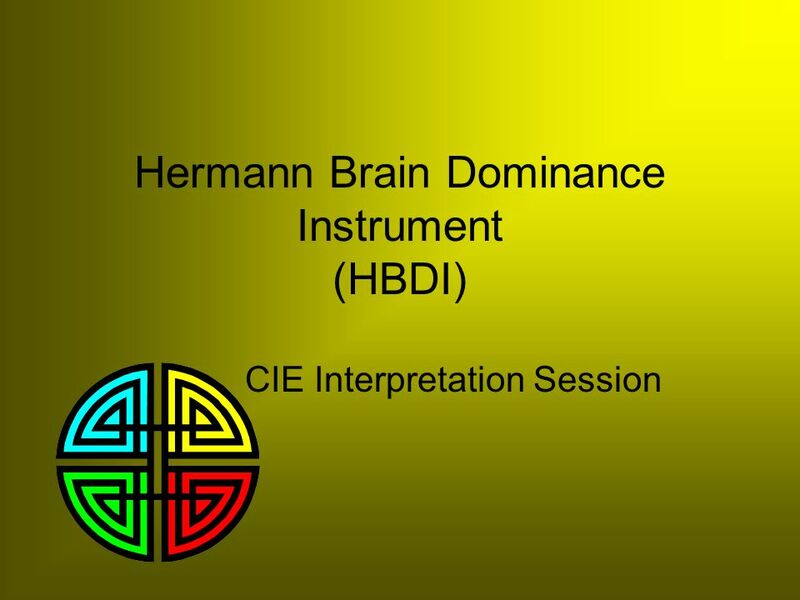 Download ppt "Hermann Brain Dominance Instrument (HBDI)"
Unit 3-B (E): Right-Left Differences in the Brain Mr. McCormick A.P. Psychology. 1 The Leader as an Individual. 2 Chapter Objectives Identify major personality dimensions and understand how personality influences leadership and relationships. Workforce Development and Achieving Organizational Effectiveness DISCLAIMER: The views and opinions expressed in this presentation are those of the author. Chapter 4. 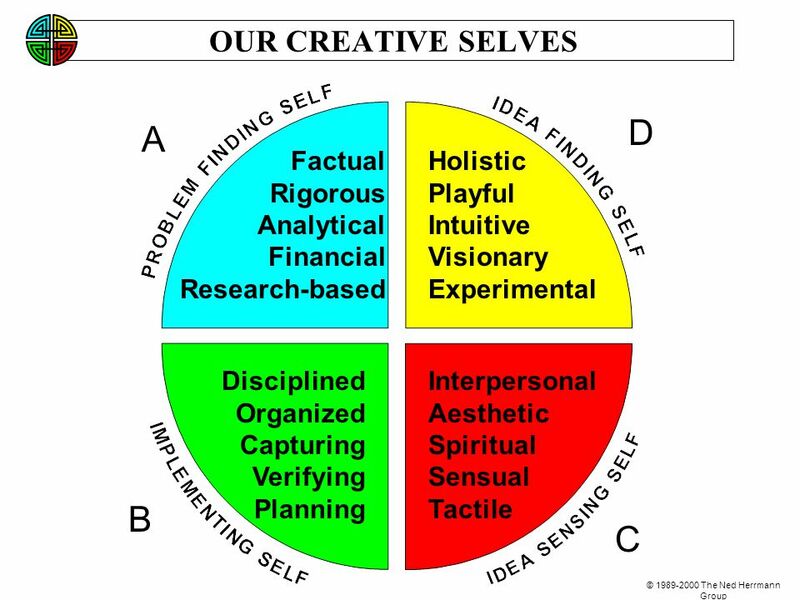 How Are You Creative? 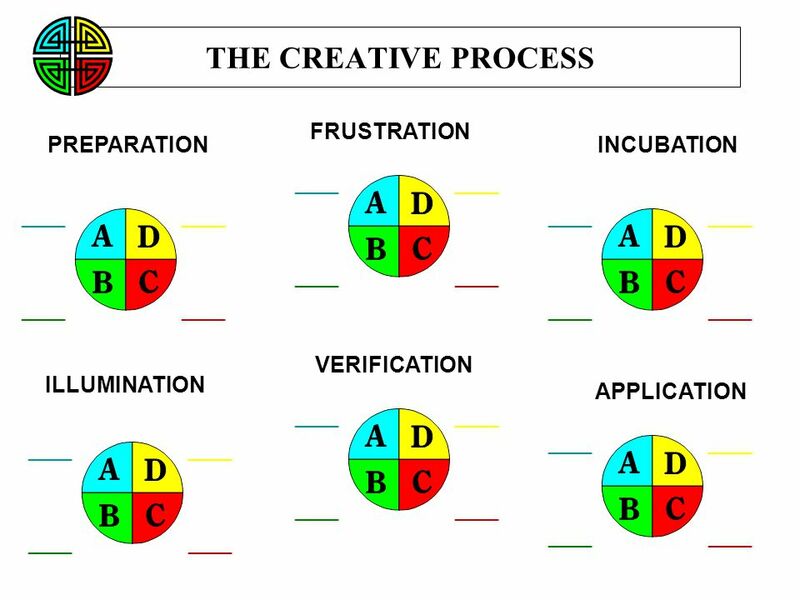 Are Creative? You How. I’m easily distracted! I have trouble following other people’s organizational plans! I have trouble making my own! NOW WHAT? What is Intelligence? Intelligence is:  The ability to solve real – life problems  The ability to find and create problems  The ability to offer a. Request for Proposal Curriculum Prototyping Prepared by SAPDC Learning Facilitator Team. New STEM Faculty Workshop (Sept 24, 2009) Introduction to Learning Styles Dale Buechler Associate Professor Dept. of Electrical Engineering Univ. of Wisconsin-Platteville. 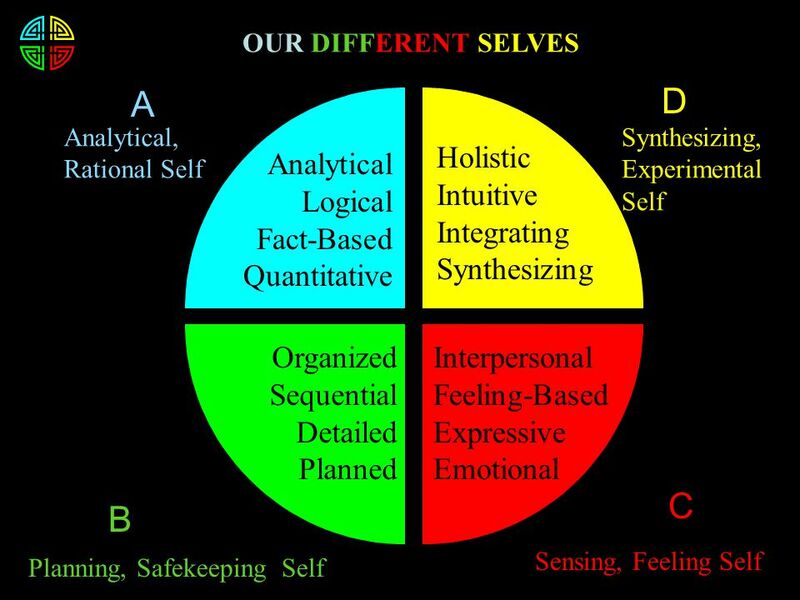 Myers Briggs In Organizations Workshop Facilitator Richard W. Moore, Ph.D.